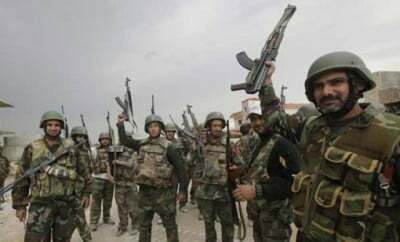 The situation is looking increasingly hopeless for the ragtag group of insurgents that have lost more than half the territory they held in just the last week. Every attempt they’ve made to break through Syrian Army lines has been repelled leaving them to defend a few shrinking districts where they will either surrender or die. Those groups which refuse to leave eastern Aleppo will be treated as terrorists. By refusing to walk out from eastern Aleppo they will in fact go ahead with armed struggle. We will treat them accordingly, as terrorists and extremists, and support the Syrian army in its operation against such armed gangs. They have withdrawn their document and have a new one. Our initial impression is that this new document backtracks, and is an attempt to buy time for the militants, allow them to catch their breath and resupply. The same thing happened with our agreement of September 9. It’s difficult to understand who makes decisions there, but apparently there are plenty of those who want to undermine the authority and practical steps by John Kerry. According to Reuters, “the Syrian Foreign Ministry said it would now accept no truce in Aleppo, should any outside parties try to negotiate one.” Meanwhile, “Russia and China vetoed a U.N. Security Council resolution on Monday calling for a week-long ceasefire.” Simply put, this is the end of the line for the US-backed terrorists that have laid to waste much of the battered country and killed more than 400,000 people. And while Aleppo may not be the decisive turning point in the ongoing conflict, it does put all of the main population centers and industrial hubs back under regime control. More important, the recapturing of Aleppo is a major setback for Washington and its jihadist-breeding allies. (US, Saudi Arabia, Turkey and Qatar) US plans for redrawing the map of the Middle East to meet its economic and geopolitical objectives has been defeated by a courageous and determined coalition (Syria, Iran, Russia and Hezbollah) that has methodically routed or exterminated the foreign-backed opposition and reestablished both state security and the sovereign authority of the elected government to control its own affairs.